The Raymond mill is the traditonal Grinding mill and porpular around the world. It finish particles have a good uniformity of finess, with passing screen rate as high as 98%. MTMTrapezium grinding mill is used as substitute of raymond mill for grinding Kaolin. It is lower consumption, lower investment, more environment friendly, smaller occupation area. What's more, there are lots of other grinding mills for kaolin grinding. For more info, you can chat with our engineers online. 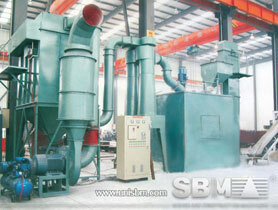 SBM kaolin grinding mill is used in kaolin powder making industry. SBM can offer ball mill, vertical mill, ultrafine grinding mill and other kaolin grinding machine for grinding kaolin into powder. "In kaolin grinding, there are several types of kaolin mills such as ball mill, trapezium mill, raymond mill etc. "